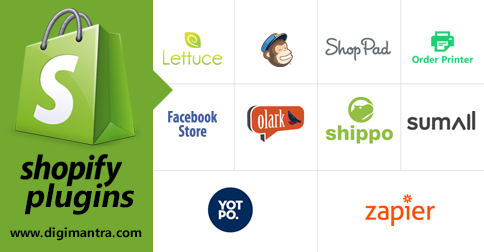 Shopify apps store offers more than 500 applications for functionality of an e-commerce store. So what are some of the must have amazing shopify plugins that you need to check out if you’re an ecommerce store owner? Lettuce is the best choice for order and inventory management as it allows automatic streamlining of product inventories, invoicing, stock count, accounting and much more options. One of the best free apps, Chimpified lets you target email campaigns easily to your niche customers by seamlessly integrating the ecommerce store with the Mailchimp account. The app has templates enabling the creation of a perfect email and segment targeting options and an entirely automated option. In an age where most browsing is reported to be done using smartphones and tablets, ShopPad has great benefits as it helps enhance your store for smartphones and tablets and build interface in a short time. It also has the advantage of not having to spend more time managing different versions of the store. This app enables simple and fast printing of invoices, labels and mail orders etc. The template can be customized for particular printing needs including bulk printing options and thus making product shipping speedier. This app helps online retailers boost their sales by marketing through social media by driving more purchases and increasing the online reach. This also enables selling of your products directly through your Facebook page. This is a live chat app that allows interaction with customers visiting your store in real time. This offers better customer support by helping customers find what they need and also minimize cart abandoning. This app enables one click printing of shipping labels for your products and is an easy way to process shipping and shipping labels. The app that is currently integrated with carriers like Fedex, DHL, USPS, UPS, and TNT etc. also checks prices across the carriers to ensure the right price for you. SumAll can be used in analytics to know the metrics about your store including sales, product units sold, and most sought after items. Store data is summarized and sent to your mail in form of daily or weekly updates. YotPo helps in generating product reviews by automatically e-mailing customers after a purchase while requesting a review from them. It has a number of customizable options. Zapier helps in easy integration of your online store with many web services including Mailchimp, ZenDesk, Basecamp etc. One-third of businesses have mobile sites. What are you waiting for?